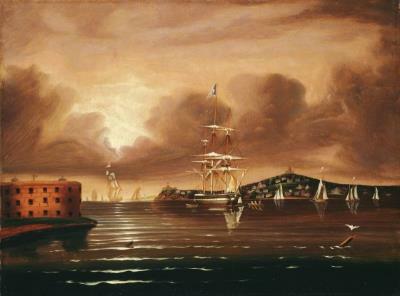 Thomas Chambers, Threatening Sky, Bay of New York, c. 1835-50, Oil on canvas, 18 1/8 x 24 1/4 inches (46 x 61.6 cm), National Gallery of Art, Washington, D.C., 365-2008-5, Photo courtesy: Board of Trustees, National Gallery of Art, Washington D.C.
“A mighty storm,” said he. And stung their reddened eyes. And churned up darkened skies. “We come when Jesus sends! “We’ve come to New York Bay! Their sides heaved with dismay. A lone, and simple plank. Rachel Dix is a sixteen-year-old sophomore at George Mason High School in Northern Virginia. She’s an aspiring actress, and very interested in the arts and humanities. She plans on going to college to major in theater or marine biology, or maybe even English. She’s been writing poetry since she was nine years old, and her poem, The Storm, is the winning entry for the Underwater New York Shipwreck Story Contest.